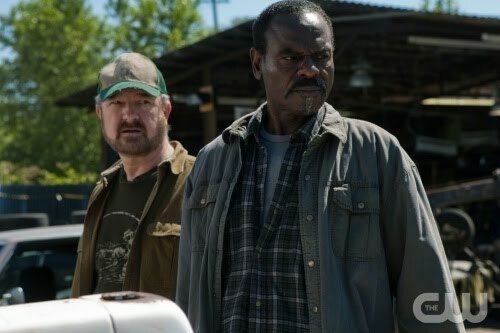 Supernatural - Another Hunter Gone? The Supernatural crew is currently filming the 16th episode of the season, titled “And Then There Were None.” And though appearances are often deceiving when it comes to this show, the clues supplied by the latest pictures from set are not adding up well for a certain beloved hunter. The scenes recently shot show Sam, Dean, and Bobby at a graveside, in a Jewish cemetery. Bobby says goodbye to their fallen comrade by dousing the grave with a bottle of Johnnie Walker Blue. Rufus, according to “Weekend At Bobby's”, is likely Jewish. And when we first met him in “Time Is On My Side” we learned that his preferred brand of whiskey was indeed Johnnie Walker Blue. Oh, Rufus, please don't be dead! Rufus Turner's first appearance came back in the third season when Bobby sends Dean out to speak with him, armed with a bottle of his favorite alcohol. Though Rufus and Bobby weren't on the best of terms in the beginning, over the years it seems they've worked on that relationship and gotten better. By the time we got to “Weekend At Bobby's” earlier this year, they could almost be described as an old married couple with their constant squabbling and general annoyance/respect for one another. The fandom has latched onto this character like few before him. Whenever a new episode came out where Rufus made an appearance, I always noted a general happiness from fans to see him again. In part, this is likely due to his friend/enemy relationship with Bobby that we've seen highlighted. He's an old, snarky hunter who can give as good as he gets. I always loved seeing he and Bobby battle it out because, in the end, you knew they would still back each other up even if they didn't always get along. Yet perhaps the spoiler pictures are not what they appear to be. It's possible they are faking Rufus' death to work the case. I'll hold onto that hope for now. But if we do arrive at “And Then There Were None” and we really do have to say goodbye to our beloved Rufus, I'll likely shed some tears. Until then, I'll remember him fondly and hope that if he has to go out, at least he can go out a hero.